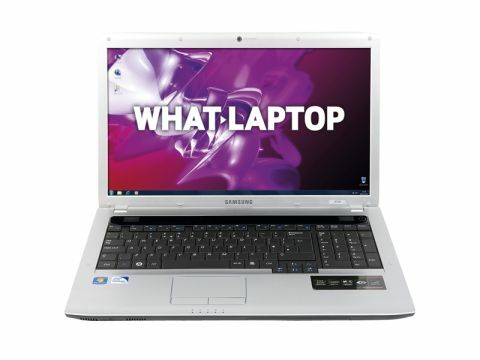 Over the past two years Samsung has impressed us time and again, releasing a range of high-quality laptops at staggeringly low prices. The R730 is an entry-level, big-screen model and proves to be a fantastic home media centre for those on a tight budget. Built around a huge 17.3-inch screen, this is a great choice for movie lovers. The widescreen panel is both bright and vibrant, showing videos and photos to great effect, while the 1600 x 900-pixel resolution shows images in sharp detail. With such a large screen, the 2.9kg chassis is quite heavy and does not suit travel use. This is compounded by the comparatively poor 188-minute battery life – the least we expect from a modern laptop. Where this laptop excels is in the level of style it provides. The combination of a glossy red lid and faux brushed-aluminium palmrest creates a high-end look that belies its low price. If you're seeking the best looking laptop you can find for less than £400, this could be the one for you. This level of quality continues across the user interface. The large keyboard is very well made, with smoothly responsive keys that move with a near silent action. The blue lighting effect that highlights the touchpad is another nice touch and adds to this machine's high-end styling. The R730 is also a capable performer. The dual-core Intel Pentium T4300 processor and 4096MB of memory allow software to run with pleasing speed and the laptop runs smoothly and quickly, even when multitasking with as many as four applications. Graphics performance is similarly capable and betters all but the Acer Aspire 5551-P32G32Mn. The integrated Intel GPU allows smooth photo editing and even basic video editing, but at this price gaming is restricted to the most basic 3D titles. Ample storage is provided by the capacious 320GB hard drive. While it is slightly bettered by the 500GB HP 620 drive, it will easily store thousands of songs, photos and videos. A DVD rewriter is also in place for creating your own discs. Unfortunately, where this laptop falls far short of the Acer is its poor software package. A range of proprietary Samsung applications allows such things as easy network and battery management, but it lacks the third-party tools of the Acer. Offering bags of style, great usability and stunning big-screen entertainment, the R730 is a fantastic laptop for the first-time buyer. While it is slightly beaten by the extra power and features of the Acer, this is still one of the best entry-level laptops you can buy at this price and comes highly recommended.